The year 2009 was one of my most productive years ever. I made 23 trips through the Western part of Europe to various locations. I made my longest trip in the United Kingdom. I stayed for ten days in this country. I visited the Salisbury Plain during this trip. This large military training area was already for a long time on my which list, and now I finally had the chance to visit it. The results of this experimental visit were outstanding with many different types of helicopters of the British armed forces. The variation during these trips was huge. I was shooting pictures from underneath my umbrella at Saint-Dizier in the north of France. All in all 2009 was a great year. On Tuesday, February 24 I went to Volkel airbase without any knowledge of what I was about to see. My goal was to make photographs of the F-16 fighter jets of the Royal Netherlands Air Force. Volkel airbase is together with the Frisian airbase Leeuwarden home base of the Dutch F-16 fleet.Volkel is together with the Frisian Leeuwarden one of the two MOB's (Main Operating Base) of the Dutch Air Force. The base houses up to three of the five F-16 squadrons which currently are based in the Netherlands. On Tuesday, March 17 I went to the TLP at the southern Belgian airbase of Florennes. It would be one of the last TLP sessions at Florennes. Seven different countries were represented including Poland and Greece at the TLP 2009/2. It was promised to be a beautiful day with a great variety of movements. The TLP is an important training for fighter pilots and it’s held six times a year at the Belgian airbase Florennes. Each course contains approximately twenty four aircraft and their crews from many different countries. On April 2, 2009 I was present at the presentation ceremony at Volkel air base of the newly painted F-16 for the F-16 Solo Display Team of the Royal Air Force. The J-015 was chosen to wear the new color scheme of the Royal Netherlands Air Force during the upcoming air shows. The team of 2009 is unchanged compared to the previous years; it exists of display pilot Captain Ralph "Sheik" Aarts, two coaches, seven technical specialists and three advisors. Together they are responsible for preparing and the actual flying of the demo. The year of 2009 was an active year for me at my home base Gilze-Rijen. I spent many hours along the fence and therefore I made a number of spectacular photographs at the main runway. The year started very well in January when an Apache landed in front of my lens. The pictures of this helicopter were outstanding because of the white landscape; it was one of my best pictures ever. Also a number of French Alpha Jets passed by this yeas and they regularly stayed overnight. I was also surpriced with the visit of two Italian F-16s. The annual Exercise Frisian Flag took place at Leeuwarden airbase in the northern part of the Netherlands from Tuesday, April 14 until Friday, April 24th. The Dutch F-16 pilots are trained during the next two weeks on their own soil in all possible and realistic conflict scenarios. Also the U.S. Air Force will participate next to the Dutch F-16’s with their F-15 Eagle aircrafts. They also fly their Frisian Flag 2009 missions from Leeuwarden airbase. The F-15's from the U.S. Air Force are based at RAF Lakenheath in the eastern part of the UK. On Thursday, April 30, 2009 I was a guest at the Belgian air base of Beauvechain in the centre of Belgium. Located in Walloon Brabant which is next to the counties of Flemish Brabant and Limburg, the 1st Wing is the 2nd largest employer in this county. The 1st Wing contains three units; the 5th and the 9th Squadron, equipped with the SF260 Marchetti and the 11th squadron which is equipped with the Alpha-Jet. I've made a nice series of images during our tour on this base of a component of the Air Force which is forgotten sometimes. After we had a visit at Beauvechain in the morning we were welcome in the afternoon for a visit to Melsbroek. Melsbroek is the home base of the Belgian transport fleet of the 15th Wing. Also the helicopter fleet of the Belgian federal police can be found on this base. The 15th Wing is responsible for air mobility within the Belgian Air Component. Mobility and flexibility are the two basic requirements for the Belgians in areas all over the world where they are active. This is a key position in the Belgian tactical airlifting. The Vliehors is a vast nature reserve on the Dutch Wadden Island called Vlieland in the northern part of the country. The Vliehors is an enlarged beach of approximately 24 square kilometers and is largely in use as a military training ground at the Royal Netherlands Air Force and is used for bombing exercises with fighters. The Cornfield Range is the only range in the Netherlands where this is possible. The Vliehors Range is a bank which is located on the western half of the island. The NATO code name of the Vliehors is the Cornfield Range. On Tuesday, May 19th, I went to the TLP at the Belgian Florennes for the very last time because it is going to disappear from this base. The TLP will move after this edition from the Belgian Florennes to the Spanish Albacete. It promised to be a special edition. For me this was the last time I visited the TLP at this great base in the south of Belgium. All good things must come to an end and sadly enough also the TLP at Florennes has come to an end. When I look back to the past, I can conclude that an era will end for me up here. In 2009 I discovered the slopes at Gilze-Rijen. The activity increased drastically at this airbase when the helicopters were moved from Soesterberg to Gilze-Rijen. The slopes are every day used for at least one or two times and sometimes more. They are mainly used by the Chinooks and the Cougars of no 298 and no 300 Squadron. The slopes are two hills in the southern area of the airbase next to the motorway. The helicopters will practice landing on uneven terrain at this location. You can shoot photos from a distance of 50 meters. On Sunday, June 14 another Meeting National was held at the French airbase of Tours-Val de Loire. A Meeting National is an air show where the French Air Force shows its equipment to the general public. Think about what the French roles are in the national and international society and how they do things in this theatre. Tours is the home base of a large part of the French Alpha-Jet fleet. The AJeTS is the international corporation between Belgium and France and is based at Cazaux and Tours in France. On Monday, June 15, I was a guest at the French airbase of St-Dizier. This base is home of the French Rafale which is built by Dassault. Currently this former Jaguar base contains over 35 Rafales; this number will double in the future because at this moment only one of the two units is equipped with the Rafale. The Rafale B entered service within the air force from 2006 and there were 36 aircraft planned which all entered service already. There are 82 Rafale C’s planned and this delivery is ongoing at this moment. On Thursday June 18 and Friday June 19, 2009, I was at the open house of the Royal Netherlands Air Force at Volkel Airbase. During these days, the visitor gets an overview of the equipment, the functions and operation of the Royal Netherlands Air Force in the past, present and future. The air force paid much attention to a spectacular air show and static display with aircraft, helicopters, guided weapons and a varied exhibition. Participants of the air show come from the Netherlands and abroad and form a nice program. On Thursday, June 25, I was a guest on the airbase of Lechfeld in the south of Germany. Lechfeld is the home base of Jagdbomber- geschwader 32 of the German air force and is equipped with the Tornado ECR. There are currently about thirty-six Tornado’s of this type at Lechfeld. The tornado ECR is a variant of the Tornado IDS and is designed for so-called SEAD (Suppression of Enemy Air Defenses) missions. The first versions of the Tornado ECR were delivered in May 1990. The Tornado ECR is equipped with the AGM-88 HARM. For two days, the air base of the Austrian Zeltweg was the location for the Airpower 2009. With highlights such as the first Austrian Eurofighter and demo flights of participants from over 19 different countries, it would be an amazing air show. I was glad I could be there during this event. The main purpose of the Airpower 2009 at Zeltweg was to show the Austrian Air Force with its material and its tasks in daily life. The equipment which was shown was quite diverse like several fighter aircraft and helicopters of the Austrian Air Force. On Monday July 13th 2009, my journey through the United Kingdom started at RAF Cottesmore. Most of the British Harriers are based at Cottesmore. The Harriers on this base are part of the Joint Force Harrier units (JFH) and are used both by the RAF and the Royal Navy. RAF Cottesmore is together with RAF Wittering home of the Harrier fleet of Great Britain. RAF Cottesmore is situated in the east of England and is located in the County of Rutland. The Harrier is a fighter with full Vertical Short Take Off and Landing properties. On Tuesday July 14, a visit to RAF Coningsby was on the program. This base is the home of the British Typhoon fleet and the Battle of Britain Memorial Flight. Four squadrons of Typhoons and a test unit equipped with a few Harriers and Tornado’s are based at RAF Coningsby. In addition to these operational units, Coningsby is also home of the Battle of Britain Memorial Flight (BBMF). This flight was founded in March 1976 at Coningsby. The British aviation history from the period World War II is kept alive by these planes. After two very successful days at RAF Cottesmore and RAF Coningsby, RAF Lakenheath was on my list to be visited today. Lakenheath is the home base the 48th Fighter Wing of the United States Air Force Europe. The wing is equipped with three F-15 units of which two of them fly the Strike Eagle. All F-15’s and HH-60’s of this Wing are identified by the tail code LN. The unit is called "The Statue of Liberty Wing" and the badge of this wing show an image of the Statue of Liberty and its the only U.S. Wing with an official name. Today a visit to RAF Odiham was on the program after three successful days. This base is the home of the British Chinook fleet and there are three active squadrons on it. During the afternoon we would visit RAF Odiham with the purpose of photographing several Chinook helicopters. The Boeing CH-47 Chinook is a tandem rotor helicopter used by the RAF to lift some heavy loads. The tandem principle means that the helicopter has no tail rotor, but two main rotors which rotate in an opposite direction compared to each other. After a period of two days in the Netherlands, I returned to the UK on Sunday July 19th. I came back to the UK to visit the RIAT at RAF Fairford. The RIAT is nowadays the largest annual military airshow in the world and also this year it promised to be a good airshow. This year’s theme of the RIAT would be the 100th anniversary of the Royal Navy Fleet Air Arm (FAA). The FAA is the aviation part of the Royal Navy. It was May 7, 1909 when the British Admiralty placed its first order to build a zeppelin. At this point the Fleet Air Arm was born. On Monday, July 20 the exercise Herrick11 was on the program for me. The exercise was held from July 13 to 24, 2009 and took place on the Salisbury Plain. This location is the largest low flying area for helicopters in the United Kingdom and is about ten miles high and twenty five miles wide. At the moment I was visiting this area, the exercise herrick11 was going on. This exercise mentioned for the 11th Air Brigade of the Royal Army is a preparation for their soldiers for a deployment to Afghanistan. My final base visit during my very successful UK trip was at RNAS Culdrose in the most southwestern tip of the United Kingdom. Culdrose is the home base of the complete Merlin and Sea King fleet of the Royal Navy. Also the Hawks of the FRADU and the Jetstreams can be found at this base. The firemen of the Royal Navy are trained in handling emergencies with aircraft and helicopters At RNAS Predannack. There aren't any active units at this base, but there are many old aircraft present for fire exercises. On Thursday, August 27, I was a guest at Gilze-Rijen Airbase in the southern part of the Netherlands. Gilze-Rijen is the home base for most of the helicopters of the Defense Helicopter Command (DHC). Up to three operational squadrons are based at Gilze-Rijen; they fly the Apache, Chinook, Cougar and Allouette III. The Defense Helicopter Command (DHC) was founded in 2008. 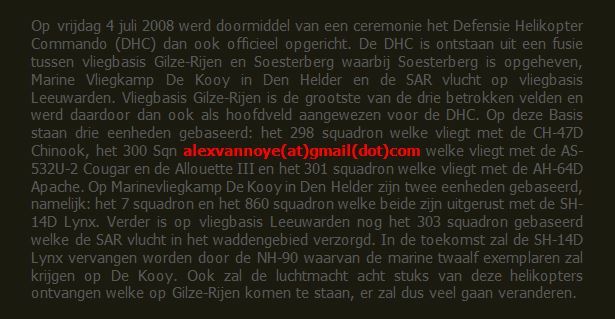 The DHC is a merge of Gilze-Rijen Airbase, Soesterberg Airbase, Naval Air Station De Kooy Den Helder and the SAR flight at Leeuwarden Airbase. On Wednesday, September 2nd, I was a guest at the German airbase of Celle in northern Germany. Celle is located 4.5 kilometers southwest of the city of Celle and 30 kilometer northeast of Hanover. The airbase of Celle can be separated into two parts, namely the airbase itself and a camp with some barracks. Celle airbase is primarily used as a training base for aspiring helicopter pilots and therefore it is a part of the German Army Aviation School. The German Army Aviation School is operating with the UH-1D and the Bo-105. The Oirschotse Heide has always been a training ground for the Dutch helicopter fleet. Activities in this area were more than doubled in the late part of 2008 since all the helicopters of the Defense Helicopter Command are now based at Gilze-Rijen. I visited this area for the first time in 2009. First it was some experimental photography because it was not at an airbase. This changed when I found out that photo opportunities were spectacular at this location. The helicopters land in the loose sand which causes some wonderful action shots. The NATO Tiger Meet took place from September 14 until September 25 at the Belgian airbase of Kleine-Brogel. This exercise is always held in combination with a spotter’s day and I was able to join this edition. All the participants of this exercise wear a cat or a tiger in its squadron badge. The NATO Tiger Meet is an annual operational exercise which will be held this year at the airbase of Kleine-Brogel in Belgium. The exercise is organized by the NATO Tiger Association which was founded in 1961 by the French Pierre Messmer. The exercise Phoenix Challenge took place at various locations in the Netherlands in the week of October 20, 2009. I followed this exercise at the Oirschotse Heide which is officially designated as Low Flying Area 5 (LFA5). During the exercise this area is used as a landing zone behind the front lines. The Oirschotse Heide will be used as a logistics center behind the front lines. The transport helicopters will use this area to pick up and deliver some sling loads and ground forces and transport them to the areas which will be occupied. Helicopters of the Dutch DHC were practicing at the airfield of Axel in Zeeland on Tuesday, December 8, 2008. I was present during this exercise. The name of the exercise was Hawkeye Challenge. The Apache who participated in the exercise remained at high altitude and therefore I didn’t saw them. I only got Chinooks in front of my lens. The Chinooks in this environment looked good. The Chinooks both landed on the grass strip. The major part of the exercise took place during the dark hours. A unique experience which not often occur.